Whether it is for a parcel lot, a total commercial development, or a complete industrial park, Asheville Tree Service has the ability, experience, and equipment to clear any sized piece of land. Given our size, personnel, size, and equipment, we can clear the largest residential, industrial and commercial parcels in less time than other tree services in the area require. We work with all the large commercial and residential developers and have built a track record for our company as a trusted subcontractor. We are one of the first contractors contacted when surveying begins. Building and construction cannot start until the space had been cleared for development. We are also mindful of preserving as much of the natural landscape as possible while still providing for a clear development lot. 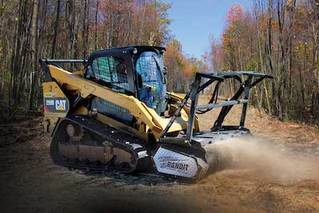 We employ all of our heavy equipment to quickly and efficiently clear the land of both trees, brush, and other debris. We always try to tread as lightly as we can yet still clear the land well enough for residential, commercial or industrial development to commence. In working with homeowners and subdivision homebuilders/developers, we work closely with everyone to ensure the land is both both prepared as well preserved, in terms of giving future landscape developers something still to work with. We can of course provide not only tree and stump removal, but also tree trimming for the trees that will remain on the development. When you need large (or small) parcels of land clearer for construction or other development, please call Asheville Tree Service. Brush cleaning is a necessary for many new office and home building sites. If you have a plethora of brush and trees, you will likely have deadfall branches, limbs, leaves and other tree/brush debris that will have to be cleared. When you choose Asheville Tree Service for brush clearing/removal, you can be assured we will clean your property up that will be all ready for celebrations, playtime with the kids and a lot more outdoor activities, such as landscaping and gardening. There are various ways to remove brush and other tree debris. We use various techniques and tools, including our brush trimmer, bush hogs, etc. to clear your house of the scrub or dead plants, brush, and debris. Clearing branches and decaying trees from your property can be labor intensive for property owners. And, having brush adjacent to your home can reduce its curb-appeal as well as reduce it's value in the real estate market. Do not allow brush, weeds, trees, and other ugly plant material take control of your outdoor areas. Call us for quick, efficient, and affordable brush removal. At Asheville Tree we focus on clearing any sizes parcel, no matter how small or bug. We have the idea equipment for the job to be done quickly and safely. When you contact us for brush removal or wood chipping in the Asheville area, one of our team members will come out to your property to evaluate the your land and discuss what your requirements are for clearing and removing brush and other tree/shrub debris.